When we travel, we prefer using local public transportation and walking to the high costs of renting a car, getting insurance, and dealing with traffic and parking. We ‘lived’ in Bucharest for a month and walked virtually everywhere we could. We rented a studio a couple of miles outside of ‘Old Town’, so sightseeing and nightlife was just a metro or tram ride away. We found that public transportation in Bucharest is extensive, frequent, and easy to use. However, modernization (digital signs and ticket machines) are mainly in metro stations and vary in their utilization from station to station. Additionally, two different companies run the metro and tram/bus system, so you’ll need to buy tickets for each transportation network separately. Becoming familiar with each system and learning how to purchase tickets for each one is important, and fortunately not too difficult. The information we found online ahead of time was dated, not in English, or lacked sufficient detail. So, when we arrived, we asked questions at the stations (attendants even pulled aside riders who spoke English to help!) and gathered as much information as we could. In an effort to help visitors to Bucharest, Romania navigate the public transportation system, we’re sharing everything we learned. If you have further questions, ask in the comments and we’ll answer what we can! Also, if you have additional information or tips, feel free to contribute by leaving a comment below. We use Uber (use our link and get your first ride free!) and taxis sparingly and under key circumstances. In Bucharest we mainly walked, but we did do one large grocery-shopping trip (at a hypermarket) and purchased several five-litter containers of drinking water. It was more than we alone could carry back to the place we’d rented on Airbnb (use our link to get $40 off your first stay!). So, we pulled up the Uber app on our smart phone and scheduled a ride. It was relatively inexpensive at $2.50 US dollars, and a great way to transport our groceries quickly and efficiently. In Bucharest, taxis and Uber are very reasonable ways to travel from one place to another. However, just as with any place you visit, abroad or at home, be aware of scams and ‘shady’ practices. Here are a few tips we do our best to follow and be aware of as we travel. There are dozens of scams that can be run, so our best tip is to be aware, assertive, and vigilant. Use your phone to set your destination on a mapping app to make sure the driver isn’t taking you the 'scenic way' to make a few extra bucks. We’ve had this happen to us a couple of times, even when using Uber. Know ahead of time what you’re willing to pay for a ride. We use Taxi Finder, an app that estimates the approximate taxi fare depending on your starting and ending location. Some taxi and Uber drivers will undoubtedly know English, making it easier to communicate. However, taxis won’t necessarily be able to rely on an app for your destinations address, so it’s a good idea to have the address written out ahead of time. At one point, going to the train station, we were able to communicate to our Taxi driver by making a “Choo-Choo” train noise. Hey, whatever it takes, right? Be creative! Get your first Uber ride free by using our link! We highly recommend that you have international calling or international data and VOIP on your phone, we use Google's Project Fi (yes, it even works on iPhones!). In our experience, about 1 out 4 Uber drivers called us before they'd start to make their way to us. Had we not had Project Fi, Uber would've been a lot less useful. Make sure the driver that arrives is the same person, with the same car and license plate number, as is listed in the Uber app. Before getting into the vehicle, say the drivers name (as given in the Uber app), and make sure they respond. Usually, the screen of the phone being used by the driver is visible. This allows you to be sure the driver is the same one you called. Plus, you can keep an eye on the route the driver should be taking. Only get into yellow, marked taxis. Within the city, expect to pay 1.39 Lei per kilometer. If you get a taxi that is more expensive, decline the ride and find another taxi. Taxis are everywhere in the city and easy to find. While you can easily signal a taxi, we recommend calling a taxi from a reputable company. When possible, have your hotel or host call a taxi for you. Make sure the meter is working and running before commencing the ride. Have small bills on you, so you can pay the exact fare. If you can’t pay the exact fare, make sure you know what bills you’re giving the driver, as they may try to switch a large bill for a small one and demand more money. The Henri Coanda International Airport (‘Aeroportul Internațional Henri Coandă București’ in Romanian) is the official name for the Bucharest airport, but it's commonly referred to by its former name, Otopeni (abbreviated OTP). The airport is approximately 11 miles from city center, but with traffic, it can take 40-70 minutes to drive to. For example, we planned on picking up a rental car from the airport when leaving Bucharest and thought the fastest way to get there would be to use Uber. As we sat in traffic, we commented on our lesson learned: traffic is much too congested in city center. Meaning that driving (taxi or Uber), or public transportation (bus or tram), take longer than taking the underground metro, because they must contend with city traffic, lights, and roundabouts. In our opinion, the metro is the best option to quickly and efficiently get to and from the airport. An underground metro line to and from the airport is in the works, however not yet complete. So, to avoid the worst of the traffic in city center, our recommendation is to take the metro line to the closest point to the airport that you can, which is Piata Victoriei, and from there use Uber. It’s still a ways from the airport, but you can bypass the worst of the traffic in city center and in our opinion, will cut off enough travel time to make the extra step worth it. A taxi from the airport (OTP) to city center will be about 30-40 Lei. It’s highly recommended that you don't accept a ride from anyone in the airport offering you one. It'll likely be very overpriced. Instead, get a taxi by using the machine in the airport lobby. All taxis called by the machine will be priced at the standard 1.39 Lei per kilometer price. After exiting passport control and customs, you’ll find yourself in the small, main lobby of the airport. To your right you’ll see a flower shop. Next to the flower shop are a couple of yellow machines that you can use to get a taxi. The machine will dispense a ticket that gives the waiting time, the name of the taxi company, and the taxi’s registration and ID number. From there, proceed outside to the curb and wait for the taxi. Once the taxi arrives, hand the ticket to the driver. First, the most important thing to understand about public transportation in Bucharest, is that there are two independent public transportation companies and networks, RATP and METROREX. RATP runs all of the surface transportation, which includes buses and trams. METROREX runs the underground metro trains. In the ‘good old days’ there was a single ticket you could use for both systems, similar to the Oyster card in London. Unfortunately, due to challenges between the two companies, the ticket was discontinued, and now a separate ticket is needed for each transportation network. Second, your ‘best friend’ when traveling by public transportation in Bucharest (or most cities for that matter) is Google Maps and Transit Directions. We use the Google Maps app on our phone, plug in our starting point (usually our current location), and enter in our destination. The app may return driving directions, but you can select the bus icon at the top of the screen to get public transportation directions. Similarly, select the walking human figure icon to get walking directions. Google’s public transportation directions usually give one or more options that you can choose from, and each one outlines the method, route, and transfers (if applicable) that you have to take. We find it incredibly simple, compared to using traditional paper public transportation maps. Clockwise (from the top): An RATB trolley bus and tram, a train station, a city bus, a map on-board a metro train, a passing tram, a metro train. Third, both METROREX and RATB journey tickets can be used by multiple travelers. So, if you buy a card that has multiple journeys or funds on it, you can use it for yourself and those you’re traveling with. You’ll notice when validating your ticket, the machine has a button that’s labeled '+2'. To validate two travelers, first validate the card once by scanning it, then press '+2' and validate the card again. If there's a third traveler, press '+2' again and validate the card a third time. Buses, trolleybuses, and trams are run by RATP. There’s an extensive network of both trams and buses, so getting where you need to go in the city is probably only a short walk away from a bus or tram stop. The RATB website has route information for all lines. We found that there are a few newer vehicles in circulation, but most are older and lack modern signage indicating upcoming stops. We highly recommend using a map with GPS on your phone to track where you are relative to your stop. We’ve found this to be a huge help in disembarking at the correct stop. Clockwise (from the top): Two trams at a station, two trolley buses, a city bus, a minibus, a newer yellow tram. Tickets for RATB transportation (trams, buses, trolley buses) are only available from staffed kiosks. They are located throughout the city. Tickets can’t be purchased on trams, buses, or employees, so you’ll need to purchase your tickets ahead of time. We were stumped at first, because we didn’t see conventional ticket machines at any of the tram stations we found. When we asked, we were told that we needed to buy tickets at the grey buildings/kiosks that say ‘RATB’ on the front. They’re tricky to find at first, since they blend in with all the other stands along the street, but once you see one, you’ll spot them everywhere. Check the RATB site for a list of the stations that have kiosks to purchase tickets. Multiplu– Multiplu cards are blue and white and can be purchased from RATB kiosks. The card costs 1.60 Lei and you can purchase it for two to ten journeys or a daily pass on it. Once purchased, this card can’t be reloaded. Activ – Activ cards are green and white and can also be purchased from RATB kiosks. The card costs 3.70 Lei, but it can be reloaded multiple times. The card can be loaded with cash in any amount between 2.60 Lei and 50.00 Lei, or with a daily pass. Purchase passes for unlimited travel on RATB. Tickets need to be validated for every journey you take, and not validating your ticket could result in a fine. Detailed instructions on validating your ticket can be found on the RATB website. 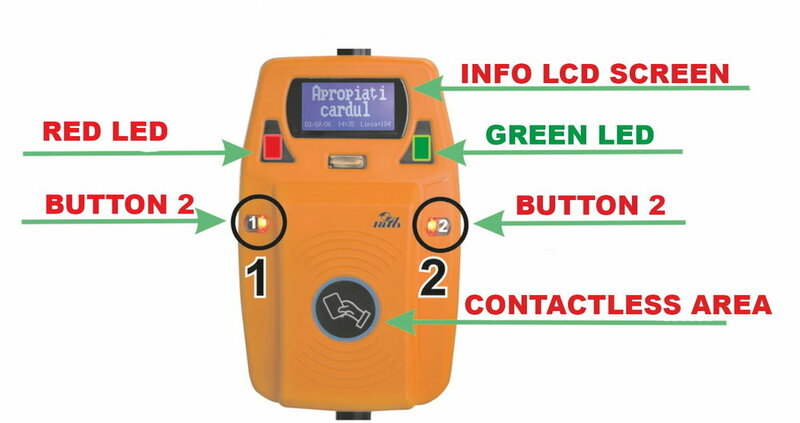 Informational image of the validation machine from RATP's website. The underground Metro lines are run by METROREX. There are currently four metro lines (M1, M2, M3, and M4), although three additional lines are in the works. Download the PDF Metro Line Map. Clockwise (from the top): Looking towards the metro inside the station, the entrance to a metro station, on-board a busy metro car, at the underground metro platform waiting for the train to arrive, when your looking for a metro station look for this sign. Tickets for the metro can be purchased at metro stations, and all stations we were in had ticket machines that accepted credit cards. There’s also the option of purchasing tickets from a person, just look for the kiosks with the sign ‘Casa’ within the metro stations. Left to right: Metro ticket machines are in the station and easy to spot since they're bright orange, an up close picture of the ticket machine payment area showing that credit cards are accepted (contactless or chip cards accepted), the Daily Pass tickets we used to do sightseeing in Bucharest. Each time you enter a station you’ll need to validate a ticket. Do this by inserting the ticket into the turnstile. It'll take a few seconds for the machine to validate the ticket and allow you to pass through the gate. There are two different types of turnstiles. When using a digital turnstile, follow the image on the turnstile and insert your ticket by lining up the magnetic strip the same way the image shows (in other words, ignore the arrow printed on the ticket). When using the older turnstiles with the large green boxes, insert your ticket in the direction the arrow on the ticket indicates. Upon passing through the turnstiles and entering the station, you can travel in any direction and make any transfers you need. Once you leave a station by exiting through the turnstiles, if you want to re-enter the metro station, you’ll need to pay for another journey by validating a new ticket (with the exception of tickets that are valid for multiple journeys, which can be 're-validated'). 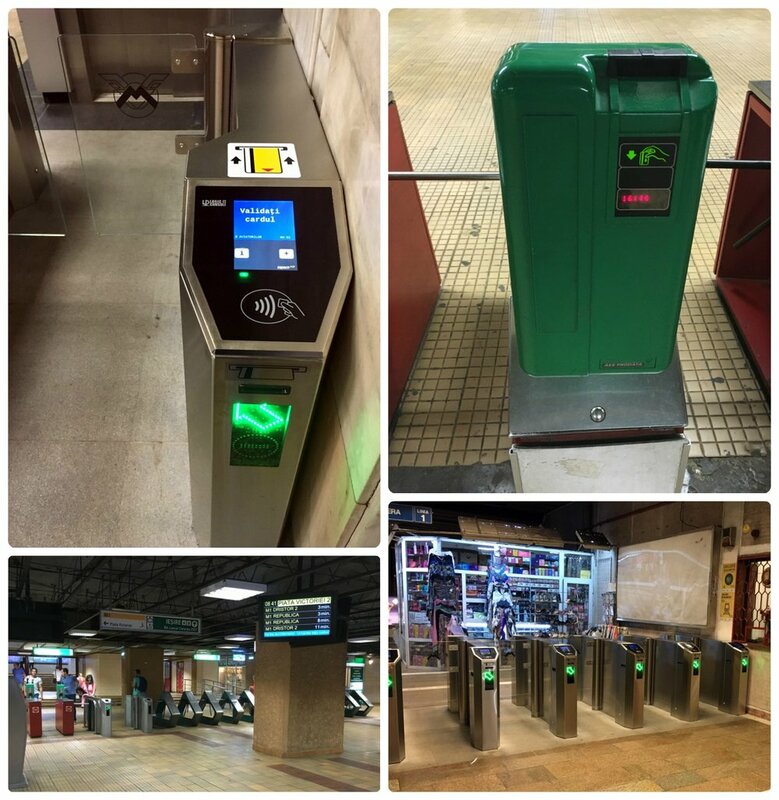 Clockwise (from the top): Up close view of the digital turnstile to validate tickets, the older green mechanical turnstile, looking at the row of turnstiles to enter the metro station, inside the metro station looking at the turnstiles to exit the station. 2 Trips – Valid for two trips on the metro. Cost is 5.00 Lei. 10 Trips – Valid for ten trips on the metro. Cost is 20.00 Lei. Daily Pass – Valid for unlimited metro trips for one day. Cost is 8.00 Lei. Weekly Pass – Valid for unlimited metro trips for one week. Cost is 25.00 Lei. Monthly Pass – Valid for unlimited metro trips for one month. Cost is 70.00 Lei. The METROREX website has a handy route calculator that will assist you in finding the best route (it's on the left side bar of the website). You'll need to know your starting station and your ending station to use it. We recommend using the metro map in conjunction with Google Transit Directions to find the stations you'll be using. Once you know your route and your destination stop, the signage in the metro stations will assist you in finding the correct platform and train. We found that stations were well labeled and had sufficient signage to help us find our way. Signs throughout the metro station will help you navigate your way. 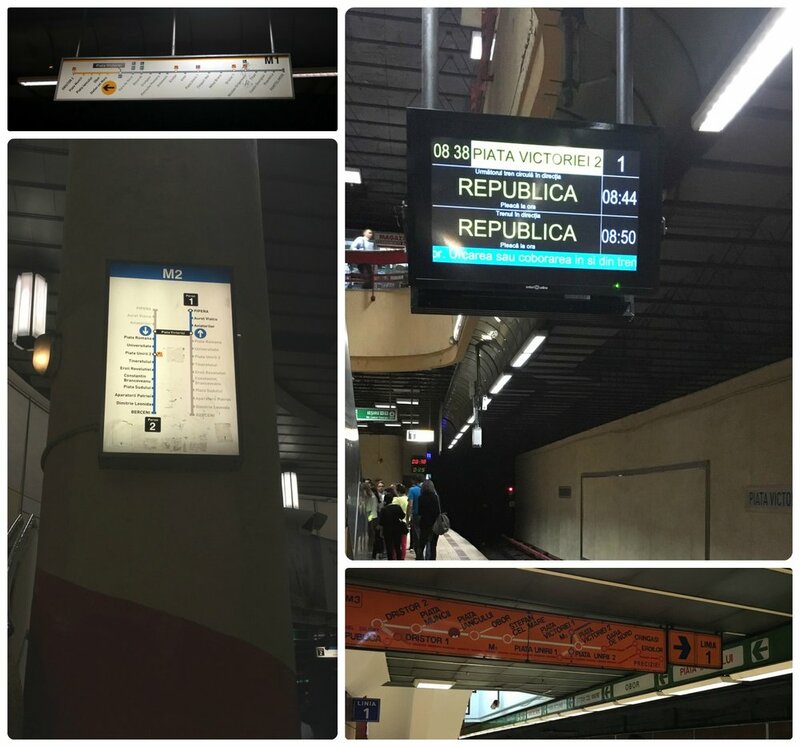 Some stations had digital signs showing real-time information for the next train, and all stations had route maps posted. In addition to traditional public transportation, bicycles are a fantastic way to explore Bucharest. Bikes can be rented all over town from i’velo stations, including a station that's adjacent to Herăstrău Park and the Triumph Arch. i'velo offers a couple of different plans for renting their bikes (Urban, Relax, and Student), allowing you to choose the one that best fits your needs. You can find maps and pricing for each plan on their website, and if you have questions, we found the FAQ section to be very helpful. Left to right: Bike sharing station at the Triumphal Arch, an i'velo kiosk, an image showing that each numbered station will be lit green or red depending on if a bike is available to be rented or not.